Yes, it’s been a while. I’ve been ignoring my foodie duties–both in the blogging sense as well as the cooking one! I am ashamed; but life gets busy and hectic and laziness takes over. Not that I’m making excuses—for there should be none when it comes to the one thing that makes life worth living——foooood. My boss excitedly handed me over a recipe last week with wide, shimmering eyes. I saw the picture first…. Pine Nuts? Um…only perhaps my FAVORITE thing in the whole wide world!!! So I took the recipe home and vowed to make the bars this past weekend (which I dutifully did!) Now, I must warn you, that the price tag for making these bars can be a bit scary. Things you need that you will probably have on hand already (although I did not) are parchment paper (don’t know why I didn’t have this in the kitchen. we all know how magical that stuff is) and Canola Oil. You’ll probably have honey on hand too, as did I, but I went all out at Henry’s Market and bought some really awesome orange blossom honey. Most of my honeys are partially crystallized and I didn’t feel like liquidizing them. 1) I didn’t want to overdue it on the pepper so I halved it. 3) I totally forgot to stir the Canola Oil into the white chocolate, but everything turned out A-Ok! Preheat the oven to 325°. Butter an 8-inch square baking pan. Line the bottom and two sides with parchment paper. In a large saucepan, melt the butter with the honey and sugar and cook over moderate heat, stirring constantly, until an amber caramel forms, about 5 minutes. Stir in the oats, pine nuts, pepper and salt and cook, stirring constantly, until the pine nuts just begin to brown, about 2 minutes. Scrape the mixture into the prepared pan and smooth the surface. Bake for about 20 minutes, until bubbling and browned around the edges. Let the bars cool completely in the pan. Run the tip of a knife around the edge of the pan and lift the square from the pan. Cut the square in half, then cut each half into 6 bars. Discard the parchment paper. Line a baking sheet with parchment paper. In a microwave-safe bowl, melt the white chocolate at high power at 30-second intervals, stirring in between. Stir in the oil and let cool slightly. 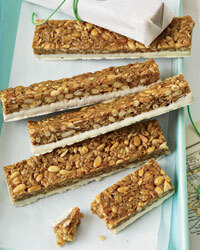 Dip the bottom half of each oat bar into the white chocolate and set the bars on the baking sheet. Refrigerate just until the white chocolate is set. If the chocolate looks thin, dip the bars a second time. The bars can be refrigerated for 1 week or kept at room temperature for up to 3 days.